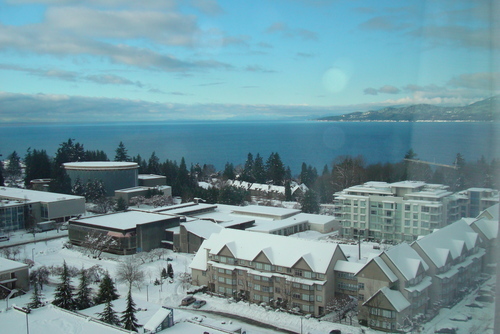 An aerial view of UBC. The campus itself is quite big, and here's a virtual map of the campus for anyone who wants to know where the various landmarks at Rift are located. After the war most people live in the Northern half due to a combination of safety in numbers, and most of the other residences being either too isolated or too risky. Gage is the residence building and tower where the Kahlites have made their den. The werewolves who live here claim their own room, but there is also a common area where most of the pack sleeps in wolf form. Fondly referred to as just 'The Bed,' this common room has been covered with mattresses, a few blankets and pillows. This place brings new meaning to the word 'dog pile.' Only one of the Gage Towers is still standing, but this is where the Lab pack now live. The view from Gage Tower in winter. Green College used to be a residence-complex for graduate students, as well as a conference centre. Now, it is where some of the mated werewolves have converted apartments in houses. Place Vanier used to be a residence-complex for students living on campus. Now it is a little sanctuary for the humans still living in Point Grey. It's a little run down, but for many it's still home. There are scattered vegetable-and-herb gardens, and talk of painting the walls. This is also where Carmel Pindar keeps her sewing/tailor's rooms. Brock Hall hosted many student services, as well as classroom facilities and program departments. It's been converted into a social arena for the lonely souls living on campus to come together. Once a month, everyone pitches in and brings food for a giant potluck feast. Most of the classrooms have been converted into food storage. Bi-monthly, teams of people go out to fill cars and trucks with supplies to bring back - previously, this had been food, but now is more likely to be clothes, batteries and other things. Brock also houses Swirl's Bakeshop, home to the famous (or infamous, depending upon your arteries' perspectives) cinnamon bun, Swirls Bakeshop is one of the few places on campus that's still running. The owners, Laura and Luke, refuse to quit, and continue to create delectable treats on Wednesdays and Saturdays. Most people frequent this place once a week, especially since now it's free. Main Library: the vast gardens facing the Library give it a castle-in-the-woods appearance. Inside, it is similar, but the atmosphere has changed. The dead silence makes the rows upon rows of books seem eerie. People think it's haunted. Every once in a while you might come across a toppled shelf, or a broken chair. People still come here to pick up a book, but they rarely stay inside. The Pit is the campus pub, located in the Student Union Building. It offers a lunch menu and, like any self-respecting pub, alcoholic drinks. People come here to decompress or let loose. The Pub is run by an enigmatic girl named Reilly. UBC Hospital: the campus has its own hospital, both for med students and for the sick. It's completely abandoned now, but it's still a valuable resource to the few medical personale at Point Grey. 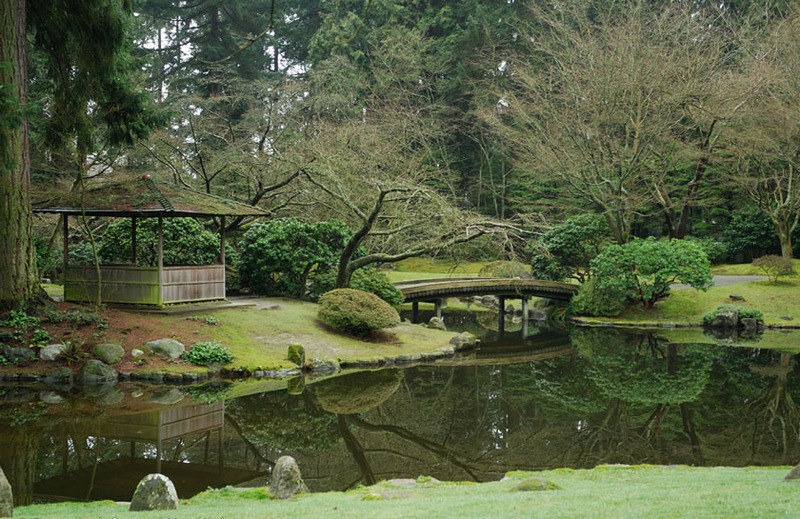 Nitobe Memorial Garden are just north of Place Vanier. It's meant to emulate a traditional, Japanese garden. There's a ceremonial tea house still standing. This is a place of quiet reflection, and even now it has kept much of its serenity. In spring the cherry blossoms are in bloom and bathe the grass in pink petals. This place is still beautiful even after the end of the world. Rose Garden is at the north end of campus, and was once the ideal spot for a romantic date. Now the gardens have grown wild and unkempt. Some people still tend to it in an attempt to return the flowers to their past glory, but in the end this garden has become a bed of thorns. Even the roses themselves have taken on a darker tint. Pacific Spirit is the meeting grounds for werewolves on the full moon. They gather here to avoid humans and hunt unseen. Humans avoid the thick foliage and damp atmosphere, wary of the howls they hear at night. Even walking down Beach Trail 6, the forest warns that this is dangerous territory. Wreck Beach: If you take Beach Trail 6 through the woods just behind Place Vanier, you'll find Wreck Beach. This long strip of sand is backed by a spine of craggy forests. It used to be a clothing optional beach where fun performances went on, but now its empty with only the sound of crashing waves to accompany a solemn walk over the sand. If you're lucky, you might see a whale breaching on the water.